People at Jack’s bar sing ‘Sweet Caroline’ on Carson street after the Penguins won their second straight Stanley Cup on Sunday, June 11, 2017. The Penguins defeated the Predators 2-0 during game 6 of the Stanley Cup final. 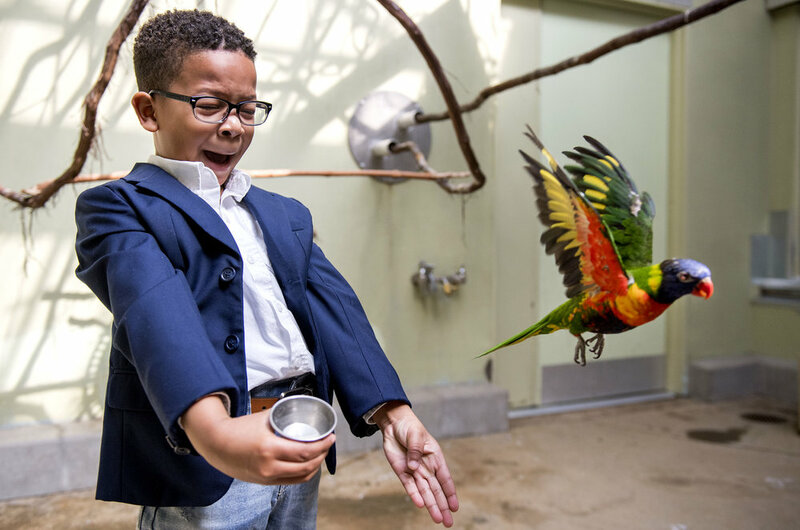 David Morgan, 5, of McKeesport, screams as a rainbow lorikeet flies away from him after trying to gain confidence to feed the bird on Sunday, April 1, 2018 at the National Aviary in North Side. AJ Alleyne, of Philadelphia, eats a catfish as the crowd goes nuts after the Penguins won their second straight Stanley Cup on Sunday, June 11, 2017. The Penguins defeated the Predators 2-0 during game 6 of the Stanley Cup final. Natalia Athias, 8, squints after getting sprayed in the face by water after playing a game of sharks and minnows on Wednesday, July 5, 2017. The Mooncrest Neighborhood Program, operated by the Felician Sisters of North America, hold summer programs and after-school programs for the kids in Moon Township. July 5 is designated as “Sister Rene Day” in Moon Township to honor Sister Rene, a Felician sister who started the program for the people in the neighborhood. Pitt quarterback Max Browne’s helmet flies off after getting sacked in the second half during the Pitt-Penn State game on Saturday, Sept. 9, 2017 at Beaver Stadium. Penn State defeated Pitt 33-14. Fans occupy as much space as they can in the Allies Garage in downtown Pittsburgh as they cheer on the Penguins players during the victory parade on Wednesday, June 14, 2017. The Penguins defeated the Predators 2-0 in the Stanley Cup Final during game 6. From left to right: Drew Stultz, also known as “Spudz,” of Anchorage, Alaska, a german shepard, Erin Hildebrandt, also known as “Lykaios,” of Frankfort, Ky., a husky, and Rob Baird, also known as “Kodaly,” a corgie, look out the window of the Westin Convention Center on Thursday, June 29, 2017. Anthrocon 2017 runs until Sunday, July 2, and has all types of people dressed in a variety of costumes, also known as furries. Neema Smith, 7, makes a face while staring straight at the stage light before getting ready for dress rehearsal with the Pittsburgh Ballet Theatre School in preparation for their May Spring Performance on Thursday, May 24, 2018 at the Byham Theater. Jemarcus Compton, 12, of Clairton, stretches his arm out to keep posession of the ball while playing with friends in an inflatable pool on Monday, June 4, 2018 at the Century Townhomes in Clairton. Several hundred residents of the Century Townhomes lost tap water for about six hours amost a month ago but it is the third time in four years that residents in the complex have had their water shut off. The Pittsburgh Ballet Theatre performed excerpts from the Swan Lake, The Symphony, and West Side Story Suite for children who are deaf or hard of hearing on Wednesday, March 7, 2018 at the Western Pennsylvania School for the Deaf. Brazil's Lia Martins takes a shot as she falls to the ground during Brazil's game against the U.S. in the women's wheelchair basketball quarter finals at the 2016 Paralympic Games in Rio de Janeiro, Brazil, on Tuesday, Sept. 13, 2016. Sarah Hartley, of Pittsburgh, holds up a sign and screams at Pittsburgh police officers during a protest outside of the David L. Lawrence Convention Center prior to Presidential candidate Donald Trump's rally in Pittsburgh on Wednesday, April 13, 2016.